Cork floors are incredible looking. They are beautiful and provide a warm inviting look to a home. Besides its great looks, an additional advantage cork flooring offers to the homeowner is the quietness of cork. Cork flooring also deadens sound keeping the noise levels in a home or commercial building at a lower level as compared to other flooring. This article’s goal is to provide step by step procedures for sealed cork floor cleaning. Cork floors are basically the same material as wood. This is because cork comes from the bark of an oak tree that grows around the coastal areas of the Mediterranean. 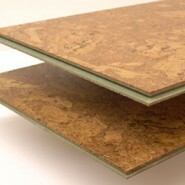 The vast majority of cork flooring comes from the factory already pre-finished with a seal/finish. What is unique about the harvesting of cork bark is that it is a totally renewable source because they never kill the tree that they harvest the cork from. So it is considered a Sustainable Green floor covering. The process of cork floor cleaning is not difficult. However, cork floors require some precautions which will be addressed in this article. The main precaution with cork floor cleaning is to remember like wood, cork floors hate water. The precautions to consider before and after the purchase of a cork floor are explained below. Cleaning Time – the time that cleaning solution has on the sealed cork floor is important. When it comes to cork floors, always use the least amount of water and cleaning solution on the floor and make sure that the cork floor dries quickly. Otherwise damage can occur from excessive water or dwell time on the floor. For this reason, spills should be cleaned as soon as possible. Cleaning Chemical – We recommend using a cleaning product that is designed for cleaning cork or wood floors. Always use the selected cleaning chemical according to label directions. Sunlight Protection: Cork is susceptible to ultraviolet rays for the Sun. So it is recommended that drapes are used to protect the cork floor from direct Sunlight. Area rugs can also be used to help protect the floor and it is also advised to move furniture and tables around on a regular basis to prevent uneven aging from Sunlight. Agitation When Cleaning: Always limit the amount of excessive scrubbing with harsh aggressive cleaning pads. Cork floors are soft as compared to other flooring and excessive scrubbing can scratch the cork floor. Humidity Levels: Try to keep humidity levels in your home around 50% because cork like wood floors will expand with high humidity levels. Furniture Protection: Due to the soft nature of the cork floor, it is recommended that coasters or pads are used for furniture legs. Dry Clean – Dust mop or sweep using an untreated dust mop. The preferred tool is a microfiber flat mop system. Use a Blunt plastic scraper to remove gum, labels, candy, etc that may be adhered to the floor. Remove the loose debris from the floor and discard in the trash. Damp Cleaning – Damp clean using a flat mop microfiber system. Be sure to use minimal moisture to damp clean the wood floor. If you notice that the floor is not dry within 60 to 90 seconds cut back on the amount of cleaner solution you are applying to the floor. The longer the wood floor remains wet, the greater the chance of damaging the floor. We recommend using a Swiffer or Bona type cleaning system where the cleaning solution is lightly misted on the floor and cleaned with a microfiber pad. Do Not use a mop and bucket wet cleaning method for cork floor cleaning. This method is difficult to control the amount of cleaning solution (water) that is applied to the floor. Excessive wetting of the cork floor can cause damage to floor.